The Performing Arts Center, with concert hall on the right and dance studios left. A new $38.5 million Performing Arts Center, described by Sam Houston State University president Jim Gaertner as "transformational for our university," has been approved by the university's regents. The Texas State University System Board of Regents unanimously approved the project during a Thursday morning conference call. The project had been submitted for approval twice previously but withdrawn for further work. Construction could begin as early as September 2008, pending approval of the Texas Higher Education Coordinating Board and the Texas Bond Review Board. The Coordinating Board meets in late July. Completion is estimated in the fall of 2010. The new building will be constructed on the parking lots just north of the Music Building and Theater Center, uniting the three into a Fine Arts Complex. 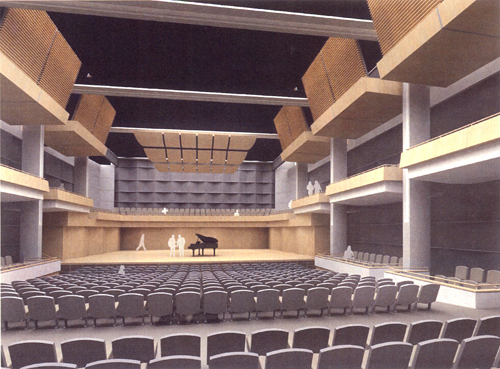 Architect's sketch of first floor of the Performing Arts Center concert hall. Features of the 91,976 square foot facility include a recital hall of approximately 150 seats, a concert hall of approximately 800 seats, a centerpiece outdoor performance area, practice rooms for dance and music, rehearsal rooms for theater, costume storage, and offices. Gaertner called the project "one of the biggest things that has occurred on our campus since I've been here." He believes the facility will be appreciated by the students who perform and as well as those who attend events, and that it will become a cultural center for residents of Walker and surrounding counties. "We have absolutely world class performing arts programs here but our venues are simply unacceptable," Gaertner said. "We've reached a stage where we deserve to have a venue that will be a tremendous asset for our campus, the community and the area." The Houston architectural firm of Watkins, Hamilton, Ross Architects, Inc. designed the center, with the construction contract awarded previously to the SpawGlass Construction Corporation of Houston. Gaertner said the regents were "wonderful" in their interest in the project, with members of the board visiting SHSU to attend performances and tour current facilities. He also praised the Performing Arts Center Planning Committee for their efforts. That committee includes James Bankhead, Doug Greening, Penny Hasekoester, Jaimie Hebert, John McCroskey, Dana Nicolay and Jennifer Pontius. Nicolay, who is now an associate dean but was for many years the dance chair, called news of the center's approval "thrilling." "I've spent my entire career in the old Men's Gym," he said. "It will be nice to have a facility designed specifically for dance. It will create a lot of dynamic synergies between the arts programs." The primary users of the facility are components of the College of Arts and Sciences. "The performing arts are an integral part of every university community," said Jaimie Hebert, dean of the College of Arts and Sciences. "We are fortunate to have nationally recognized programs in our fine arts departments at SHSU. This new facility will allow us to showcase these top quality programs and provide a fitting venue to market and share our faculty and students' talents with the campus and community." "The building will tie the Music Building to the University Theater and brings dance into the mix," said James Bankhead, who chairs the Department of Music. "It will be a major step toward forging a School of the Arts. It will be great place for social gatherings and events." Bankhead said the center "will put us in a league with the best schools in the state." "It will be a place of learning, building, developing talent and sharing ourselves and our art with everyone," he said.